Momma on a Mission: Does birth matter? My story. Does birth matter? The baby matters, of course. But is the way we welcome the child into the world really of importance? Is there something to be gained or lost, for the mother or child, in the act of giving birth? Although these questions evoke some strong thoughts feelings for me, I'm not going to attempt to answer these questions all-encompassingly, at least not in this post. Instead I want to share something more personal: a different side to my birth story, my answers to these questions. Although my son was born in 2010, his birth story starts a year earlier. My world was rocked, quite literally, in 2009. The things I experienced would change my life forever. It started in March. Someone gave me a book, and as I opened that book I knew something was going to be different. But let me back up. I grew up in a very fundamental home, with lots of religious rules and expectations. Daddy was definitely king of the family, and all of us girls(my mother, my sister, and I) were to submit to his every whim. I could fill an entire blog with posts and posts about my childhood, the things I was taught and the way that I was raised. I touched on it a bit in this post. But since I'm trying to tell you my birth story, let me attempt to summarize. I never learned to think for myself. I didn't learn to think, speak, act, learn, EXIST for myself. I was a follower, and not because I wanted to be or because it was my personality. I tried to be perfect- the perfect daughter, the perfect sister, the perfect Christian. Even as I was graduating from high school(we were homeschooled), I didn't have dreams or goals. I didn't want to go to school. (Although looking back now, I can see that the real me was inside all along, and I just didn't know it. I did two semesters at a community college, and I couldn't figure out why, but I felt so fulfilled there in school!) I didn't have any dreams besides being a wife and mom. No career goals, no desire to support myself, nothing to reach for. The only thing I wanted was to be married. And it happened. I married my wonderful husband, and I'm so thankful now that I did. But sometimes now as I look back, our courtship relationship and early marriage seems somewhat tainted by the fact that I wasn't really living, wasn't truly making decisions as ME. Every decision that I made for the first 23 years of my life was made because I thought that someone else would want me to. Every single one. So now back to March 2009, and that book. As soon as I started reading it, I knew something was different. I couldn't soak it in fast enough. This book was telling me that I was valuable, that I could and should think for myself. That I should set boundaries on the way that others treated me. That I could do whatever I wanted to; be whoever I wanted to be. That if I wanted something, I could make it happen! For the first time in my life, I took an honest look at my life. Was it truly the life that I wanted? How did I end up here? Was I happy? And the answer was no. I wasn't happy. But even though I wasn't happy, I felt so much freedom just from being honest with myself! Just being able to admit to myself that I wasn't happy was such a good feeling. For the first time in my life I was realizing that I had the right to get what I wanted out of life, and I realized that what I wanted looked a lot different than what I had! And suddenly I felt all these desires starting to rise up inside me- to go to school and get a degree, to have a fulfilling career and help people, and most importantly- to be healthy, happy, and confident in whatever it was that I chose. But here's where the problem came in. You're probably wondering by now why I'm not telling you the name of this "wonderful" book that opened my eyes. See- that's the thing. This book was written by the leaders of a little cult. There was a lot of truth in it, but there were also a lot of very damaging, extreme, out of balance ideas. And in my naivety, I accepted all of it. I can't blame myself for it- these people showed me the first glimpse of life outside my cage- the cage that I didn't even realize existed. Of course I trusted them. I'm not proud of it, just trying to be honest. So picture it. A husband and a wife. The wife comes from a damaged background and hasn't ever learned to think for herself or really live life. The husband has an idea that things aren't exactly normal with the wife, but has no clue what's wrong or if it's really a big deal. Then the wife reads a book that tells her that she can live life to the fullest, but also that her husband is a super jerk and the source of all her misery. I'll give you one guess as to how that turned out. I'm not even going to begin to go into all the details of what happened those next 10 months. But lets just say it was a literal nightmare. Our marriage fell apart. There were fights, hurtful words, and so many tears. Those were the darkest days of my life. I didn't know who he was anymore, and he certainly didn't know who I was. I was a completely different person than the woman that he married. And in becoming a completely different person, I had changed the marriage contract. I felt guilty, but at the same time I knew that I couldn't go back to who I had been before. We were at an impasse. At the end of June, I found out I was expecting again. (I guess we found a good day in there somewhere!) I was excited, but of course the idea of a pregnancy and another baby just added so much more stress. On top of that, we were seriously struggling financially. Sometimes I didn't know where I would get grocery money for the next week, or if we were going to be able to pay the midwife for Tristan's birth. And of course with all the issues we were having in our marriage, I blamed him for the money troubles, and he blamed me. We both thought it was hopeless. Neither one of us could see a way out, but we didn't throw in the towel right away like we both wanted to- him because of our daughter, and me because I didn't want to live the rest of my life with regret if I hadn't given it my best shot. I went into a deep depression. Life as I knew it was crumbling. I thought I was going to lose my family, my life, everything. I had no means to support myself if we did divorce, but I knew it wasn't possible to live with so much turmoil for much longer. I felt completely hopeless. I questioned everything. I questioned God and why he would let something like this happen to me. It took all the strength I had just to make it through each day. I'll be brutally honest here- I even considered suicide. And then, one night in one of my darkest moments, the Lord gave me a song. Would you dare, would you dare to believe, that you still have a reason to sing. 'Cause the pain that you've been feeling can't compare to the joy that's coming! Hold on- you've got to wait for the light. Press on and just fight the good fight. 'Cause the pain that you've been feeling is just the dark before the morning. It came on the radio as I was in my bedroom thinking thoughts of despair, and I knew it was for me. I barely dared to believe- but that song gave me hope. I didn't see how the pain that I was feeling could be pale in comparison to the joy that was coming. It seemed impossible. But I had to believe. For months I clung to that song. And I felt like the Lord had spoken to me that by the time Tristan was born, everything would be okay, and that his birth would be the start of good things for us. I didn't think it was possible, but I didn't have anything else to cling to. I was afraid that the stress would have an effect on the baby, and harm him somehow. There have been multiple studies showing that stress is bad for an unborn child. I felt so guilty, but there was nothing I could do to make it go away. And between the stress and lack of money, I had no resources to devote to a healthy diet. I knew it was important, but there was nothing I could do to make it better. I thank God that my baby came out happy and healthy. After many months, we agreed that we'd try counseling as a last resort. I'm so thankful that my husband was not too proud to get professional help. After a false start with a counselor that really sucked, we found a someone that was able to help us. We sat down and honestly talked for the first time- maybe ever. It took several rocky sessions, but my heart started to soften. I realized that my husband was not the monster that I had made him out to be in my mind. I realized that he was a sincere person- a person with flaws, but with sincere motives. We still had issues- big issues. But as we began to be honest with each other, and trust again, we started to work through them. I'm not sure how things developed from there. I think it was part miracle. But somehow, by God's grace, we were able to put our marriage back together again. And on February 28th, 2010, I went into labor. 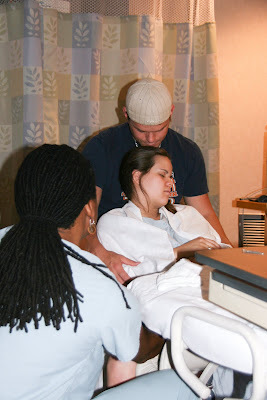 I had considered a homebirth for my first birth, but ended up in a hospital. It was a natural birth in the technical sense of the word. I didn't have any drugs, but it wasn't a truly natural birth. And what was worse is that I don't feel like I was really mentally present during her birth. Just like the rest of my life before my transformation, I wasn't in charge. The midwife was. She would tell me when to move and what positions to try. She told me when to get in and out of the shower. She broke my water. And even though I made it without pain meds, it was through sheer willpower and my stubbornness to refuse it- not out of courage and strength and trust in myself. So this time I wanted more. I wanted to really trust my body, to listen to my body and let it and me call the shots this time. I was really living life now, and I wanted to birth MY way. This birth was a statement for me, a proving moment me- that I am strong, that I can reach my goals and dreams. If I can make it through that year of hell, and if my body can give birth to a baby without any help, then I can do anything. There's a line in the movie, The Business of Being Born, that really spoke to me. It was my inspiration in the weeks leading up to the birth. "I saw a mountain that was higher than anything I had ever seen before- and then I scaled it." And that's exactly what I did. The dark days we went through- I've never experienced anything harder. And physically, giving birth- I've never experienced anything harder. But I did it. I pushed through and tasted victory. I gave birth my way, on my turf, to my child. It was such a transformative, empowering experience. I didn't just give birth to a child, but to a whole new me. Even to this day I look back on that experience when I need to motivate or encourage myself. If I'm strong enough to do that, I can make it through anything. I chose Ezekiel for Tristan's middle name. It means, "The Lord will strengthen". And He has, in every way. And yes, birth does matter. You can read Tristan's actual birth story here. I am sending this to my husband. Not because he is fundamentalist, but because it encapsulates in every way why I am so glad we moved away from certain "Christian" mindsets. Your honesty, your perseverance and your courage gripped me and brought me to tears. Thank you so much for sharing. Thanks Heather. I'm honored. I hope your husband enjoys it too. I'm in tears, what a wonderful story. Thank you for sharing it. Sorry I don't have anything substantial to say, I am just so very moved by your journey! Wow! I feel like you are writing part of my life story. I've been reading through some of your posts and I'm shocked at how much I can truly relate to. God has been working on my heart and I feel like your blog is a tool He is using. So, thank you for your honesty and openness!